More than ever before, sound technology permeates every aspect of our lives. Our communication, labor, and entertainment practices involve voice recognition software, microphones, and operating systems, yet we are often unaware or unfamiliar with the design, mechanics, and political implications of these tools. Listening (to) Cyborgs invites graduate students across different disciplines to address these issues by engaging with, questioning, and appropriating many of the diverse sound technologies that make up daily life and social practice. 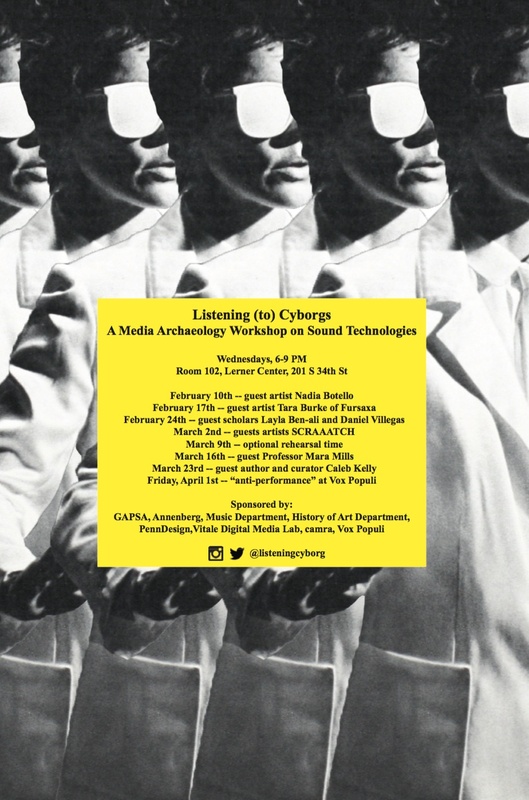 Organized by PhD candidates Roksana Filipowska and Maria Murphy, Listening (to) Cyborgs is a media archeology workshop that explores how analogue and early digital technologies engender users and listeners, distribute bodies, articulate gender, and constitute political agency. Inspired by the work of Laurie Anderson, the workshop looks back to the moment of transition and coexistence between analogue and digital sound tools to inspire participants to learn to use—and playfully explore—the sound technology that surrounds them today. Purchased equipment includes mixer, harmonizer, vocoder, voice looper pedals, and contact microphones. Comprising of seven sessions between January and April 2016, the workshop is structured to encourage open discussion, play, and collaborative experimentation. Each session includes ample time to tinker with the technologies, as well as interrogate their production processes through such discussion topics as the democratization of media and the historicity of analogue and digital processes. Workshop guests include sound artists, scholars, and curators and the project culminates in an “anti-performance” of original compositions and key pieces by Laurie Anderson at Vox Populi on Friday, April 1st. The entire workshop is free and open to UPenn graduate students from all departments. We also welcome anyone from UPenn and the broader Philadelphia community wishing to stop by for a single session. No background in music necessary.